It's not like Mardi Gras had never been cancelled before. It had happened throughout the years of U.S. involvement in World War II, from 1942 to 1945. It also happened in the Korean War, the final year of World War I and the year that followed, as well as during the Civil War. Each of those times, it was an unfortunate but understandable thing. But 1979 was different. That year, the cancellation of Mardi Gras felt so political, so man-made -- and so infuriatingly avoidable. It was a year in which the build-up to New Orleans' annual season of celebration and debauchery was dominated not by king cake eating and good times rolling. Rather, it was the year the city was gripped by an extended, headline-grabbing police strike. It was the last time the city found itself in the position of having to cancel its "Greatest Free Show on Earth." Granted, given the party-proud spirit of local residents, there really isn't a way to outright "cancel" Mardi Gras. It's a people's party, not the city's, the police department's or anybody else's. What's more, if you know anything about the people of New Orleans, it's that they will party. Especially if you tell them not to. Somebody died? Throw a party. A hurricane is on its way? Party. The Saints missed the playoffs? What the heck. Let's party, y'all. 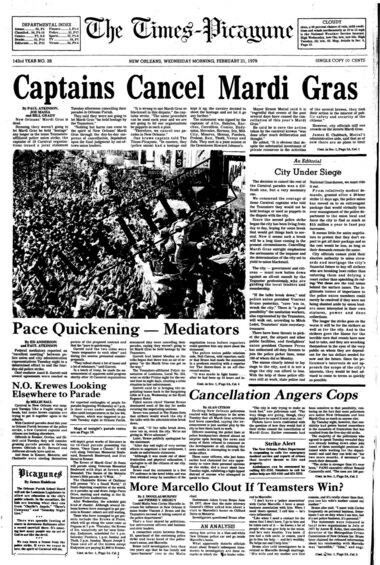 True to form, and contrary to popular remembrance, there was still a Mardi Gras celebration in 1979. But it was like none other, before or since. 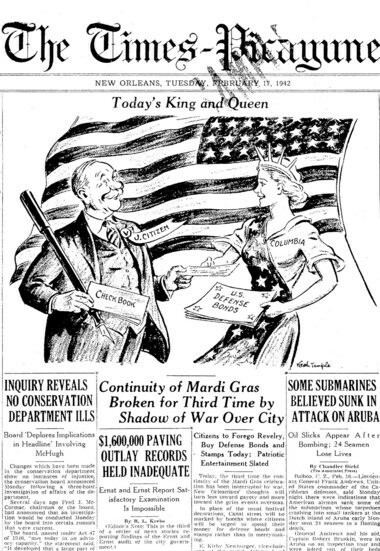 ON FAT TUESDAY 1942, the first Mardi Gras following America's entry into World War II, the cancellation of Carnival had been treated as a patriotic, unifying affair. While banks and most city offices were closed for the day, schools remained in session and most stores were open for business, as were most state and federal offices. "In place of the usual festival decorations," read a front-page story in the Feb. 17, 1942, edition of The Times-Picayune, "Canal Street will be marked by booths where citizens will be urged to spend their money for defense bonds and stamps rather than in merrymaking." Above the story was an illustration by longtime Times-Picayune political cartoonist Keith Temple. Titled "Today's King and Queen," it showed a mustachioed New Orleanian -- labeled "J. Citizen," his checkbook in hand -- buying war bonds from Lady Liberty. Also included in that day's paper was a 40-page special section titled "New Orleans Knows How to Work As Well As Play." On its front page was an image of what was to be that day's Mardi Gras special section, with a large black "X" over it. Instead of Carnival stories, readers found a broad collection of articles outlining the city's extensive war effort. The run-up to Carnival 1979 was met with no such patriotism. Instead, it brought extended and very public bickering between Mayor Ernest N. "Dutch" Morial's city administration and union leaders representing the rank-and-file of his police department. Although the incident is remembered as "the" police strike of 1979, it was in actuality two strikes. The first was an effort by the Teamsters-backed Patrolman's Association of New Orleans to restore employee benefits cut at the end of 1978 and -- this was a biggie -- to rescind sole recognition of a rival police organization as a bargaining agent for police. PANO would end up winning that round. But things would come to a head again about a week later. This time, there would be no real winners. While the Morial administration offered key concessions -- including higher pay for officers and other benefits, including increases in life insurance, hospitalization benefits and uniform allowances for officers -- the city stood firm against other demands that Morial insisted would essentially turn over management of the police department to the union. Another key sticking point between the city and the police in the second go-round was a demand from the newly recognized police union that Morial's administration submit to binding arbitration -- something City Councilman Brod Bagert said the administration couldn't legally do. "In effect, they're saying that unless you jump out of the window and fly a mile without flapping your wings, or unless you turn yourself into an apple, we're not going to negotiate," Bagert said. "They've placed a condition on continuing negotiations which cannot be fulfilled." THE TIMING OF THE 1979 POLICE STRIKE was no coincidence. Every year at Carnival time, it's all-hands-on-deck for the New Orleans Police Department, with every warm body needed out on the streets to help make sure the rowdiness falls on the right side of anarchy. By all accounts, they were -- and still are -- better at crowd control than those pretty much anywhere else. So the cops knew as well as anyone that they were key cogs in the annual Mardi Gras machinery. As it turns out, they were also ready to prove their willingness to throw a monkey wrench into that machinery if necessary to improve their working conditions. "I've got a kid who likes Mardi Gras parades, but I guess that's just tough," one officer told The Times-Picayune outside the 5th District police station. "That's just real tough. We're holding the cards and you don't fool around with four aces." Daily, the detailed back-and-forth between PANO and Morial's administration would play out in the media. Daily, those stories brought heated and mutual sniping from both sides, as well as the type of thorny, jargon-laced issues typical of labor disputes. But amid it all, there was a measure of hope that things would be settled in time to avert the first peacetime Carnival cancellation since Reconstruction. Those hopes were all but dashed on Feb. 16 -- the first big weekend of Carnival 1979 and just 11 days before Fat Tuesday -- when the city's cops walked away from the bargaining table and off the job. That night, Morial said 1,100 National Guardsmen and state police would be on duty in the city by noon the next day. All of the seven stories on the front page of the next morning's Times-Picayune dealt with the police strike. That included an editorial headlined "Back to Work -- Now!" "Council vows no 'surrender' to union," read another. Yet another story, about local residents fortifying themselves against the potential for opportunistic crime, was headlined, "Wanted: Guns, Guards, Locks,"
Most distressing, at least for chronic parade-goers, was a story headlined simply, "Carnival Outlook Gloomy." Indeed. Unsurprisingly, things would quickly get emotional. It being New Orleans, there would be no small amount of pageantry, either. Striking police officers dramatically burned their uniform shirts in front of news cameras at the Broad Street police headquarters. In a sign of the times, others took to the picket lines in T-shirts emblazoned with the words "Take This Job and Shove It," borrowing the title of Johnny Paycheck's 1977 country hit and blue-collar anthem. From there, it got downright ugly. Police cruisers parked outside the 7th District station on Read Boulevard had their tires slashed. Roofing tacks spread throughout the parking lot punctured tires of department employees and civilians alike. Other cop cars were firebombed. Eggs were hurled at Morial's home. Even journalists would find themselves impacted by the ever-building tension. During a press conference with union leader Vincent Bruno -- and in full view of rolling TV cameras -- local newsman Bill Elder would get into a physical altercation with another member of the media. 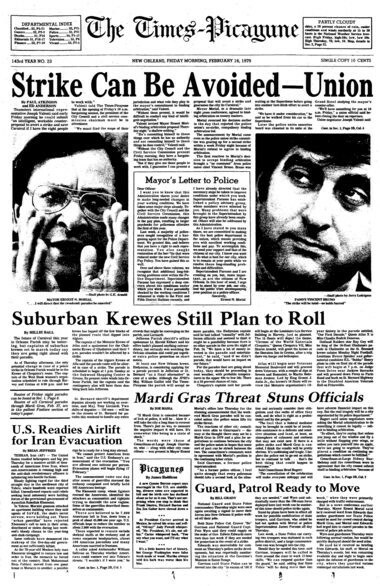 With emotions running high, and in the interest of public safety, Morial requested the captains of all 11 Orleans Parish Carnival krewes scheduled to roll that weekend to cancel their 1979 parades. Six did just that. Others relocated to suburban parishes where police were still on the job. The Krewe of Choctaw traded Algiers for Gretna. Shangri-La bolted for Chalmette. The Krewe of Hestia-Mecca decided simply to constrain their 20-float procession -- with singer Frankie Avalon leading the way -- to an exclusive audience in the old Rivergate convention center. As the days dragged on, however, things only got gloomier. STRIKING OFFICERS CLAIMED they didn't want to see Mardi Gras cancelled. At the same time, though, they also vowed to stay on the picket line "until Doomsday" if necessary and to "bring the city to its knees." If the public was ever on their side as far as improving their working conditions, the general, uneasy consensus was that they were holding Carnival hostage to accomplish that. While regular, everyday residents couldn't do much about it, the captains of some of the city's most prominent Carnival krewes were having none of it. A week before Mardi Gras, and after five days of increasing tensions between the Morial administration and police, the captains of 18 krewes -- after meeting in a joint session at the Downtown Howard Johnson's -- issued a statement. This time, it wasn't the traditional proclamation of their parade dates or that of their annual bal masques. This time, their message was more dire: Carnival 1979 would be cancelled. As much as the police wanted to blame the administration, which had repeatedly made concessions during negotiations with the union, public sentiment had turned -- and it wasn't in favor of the cops or the Teamsters. "Nothing but harm can come to the spirit of New Orleans' Mardi Gras through the day-by-day suspense of cancellation, dependent upon the final judgment by out-of-town union leaders," the krewe captains wrote. They continued: "It is wrong to use Mardi Gras as blackmail in this dispute. The same procedure can be used each year and we are not going to let our organizations be puppets in such a plan. Therefore, we cancel our parades in New Orleans." A front-page editorial headlined "City Under Siege" further excoriated the Teamsters and the out-of-town union leaders who were described as fanning the flames of police officer discontent. "To the strikers goes the blame for the terrible turn that events have now had to take," the editorial read, "and they are wrecking themselves in the eyes of the very public on whom they are dependent for the tax dollars needed now and the future." The strike would go on, but for all intents and purposes, the cancellation of Carnival robbed the striking police of a key bargaining chip. What's more, they were blamed for the whole mess. "It won't affect me personally," local resident G.A. Grelier was quoted as saying in a story charting New Orleanians' reactions to the strike. "But it will affect the economy, tourism, people's impressions of the city who are contemplating coming here. The police have made a very grave mistake. They'll never have the same respect from me." It was not an uncommon sentiment. "I'm mad as hell, if you'll pardon my saying that," local resident J.D. Evans said. "I did sympathize with the police but I think they've jumped higher than they should have. ... I'm mad at the unions. I don't like unions. Period." In retrospect, it would end up marking the beginning of the end of the whole saga. 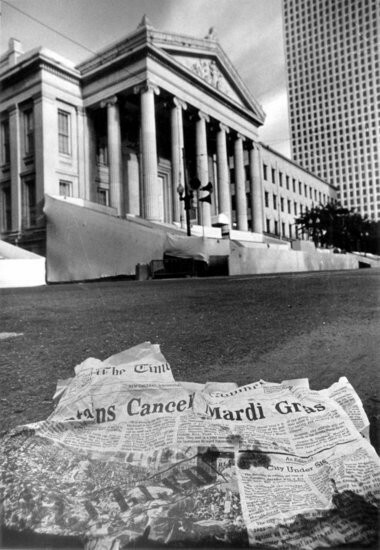 NO PARADES ROLLED IN ORLEANS PARISH on Fat Tuesday 1979, leaving Canal Street deserted and the viewing stands in front of Gallier Hall uncharacteristically empty. The sight of eerily empty grandstands was repeated on Lee Circle. In the packed French Quarter, however, the party went on. In addition to costumed revelers taking to the streets, a mock jazz funeral was held in front of St. Louis Cathedral for the Mardi Gras that wasn't. Fittingly, and in an only-in-New-Orleans flourish, the accompanying pronouncement was made by Orleans Parish Coroner Frank Minyard. "They told us Mardi Gras was dead, so we're burying it," Minyard said. "But we're starting Mardi Gras 1980 as of right now." Meanwhile, rather than mothballing their throws, many of the city's krewes simply relocated to the 'burbs for the day. With pleasant weather and temperatures in the mid-60s, an estimated 1 million-plus people flocked to Jefferson Parish's Mardi Gras celebration, where "M*A*S*H" actress Loretta Swit reigned over the Krewe of Argus' 12-float parade. Among them was no small number of New Orleans police officers, most of whom left the picket line for the day for a rare chance to enjoy Mardi Gras out of uniform. "This will be my first chance in the last 20 years to enjoy Mardi Gras with my family," one striking police officer said. "And I plan to enjoy it, because I don't think the opportunity will present itself again for a long time." Over on Gravier Street, behind police headquarters, those officers who remained on the picket line organized an impromptu parade of their own. Dubbed the Krewe of Police -- or KOP -- they threw beer-bottle caps instead of doubloons. In lieu of trinkets, they threw dog biscuits and, in a pungent twist on the popular Zulu coconut, onions. Just as the band played on in the French Quarter, so did the strike go on after the party ended. But not for much longer. On March 4, five days after Mardi Gras, the New Orleans police strike suddenly ended. Bowing under the turn of public opinion against them and the loss of bargaining leverage brought by the Carnival crisis -- not to mention personal pain of lost paychecks, including the lucrative overtime pay that typically comes with Carnival season -- hundreds of officers traded their picket signs for their badges and reported for duty. Not helping was that Teamsters leaders failed to persuade the city's firefighters and sanitation workers to join the labor stoppage. And just like that, the strike was over. Memorably, it had brought the first peacetime cancellation of Carnival since Reconstruction. It was also, to date, the last. "The union failed to realize how important Mardi Gras was to the community," Police Superintendent James Parsons said in a UPI wire story distributed to newspapers nationally. "This community rose up -- it filled this community with a deep resolve not to be treated that way."